So we've been tweeting, purusing message boards, and sending emails nonstop to try and find out just who actress Gal Gadot's hair stylist is. Because whoever took care of her locks for her epic appearance in Batman v Superman Dawn of Justice, well, they nailed it! Wonder Woman bursts onto the scene in the 2016 smash hit movie, and well, she kind of steals the show (at least in our opinion)! But once we got this deluxe wig into our costume studios, we quickly found out that all of our effort was for naught. Because this wig captures the on screen style of the Amazing Amazonian to a tee! With long synthetic strands of hair, and just the right amount of curl, when you have this wig on you'll feel ready to slip on a Wonder Woman costume and straight up lay the smack down. 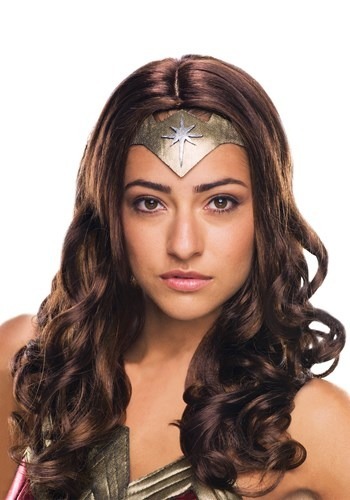 So whether you have your sights set on becoming Wonder Woman for Halloween, or just want to cosplay as Diana Prince at your next event, this deluxe Dawn of Justice adult wig will be the perfect fit!